LOS ANGELES, Nov. 17, 2015 -- Propel Fuels launched Diesel HPR (High Performance Renewable) across Southern California in August 2015, and consumer adoption of the fuel has risen 300 percent compared to its former biodiesel product (B20). Propel's Diesel HPR is a low-carbon fuel that meets the ASTM D-976 petroleum diesel specifications for use in diesel engines while offering drivers better performance and lower emissions. Performance features include a 75 cetane rating, 40 percent higher than regular diesel. Diesel HPR provides cleaner and more efficient combustion for more power and a smoother ride at a cost similar to or lower than petroleum diesel. According to the U.S. Department of Energy's Alternative Fuels Data Center, renewable diesel's high combustion quality results in similar or better vehicle performance compared to conventional diesel, while California Air Resources Board studies show that renewable diesel can reach up to 70 percent greenhouse gas reduction compared to petroleum diesel. Diesel HPR improves local air quality due to the reduction of harmful nitrogen oxide (NOx) and particulate (PM 2.5) emissions. NOx and particulate emissions are directly linked to air quality in California, negatively impacting children, people with lung diseases such as asthma, and people who work outside. "Diesel HPR is an affordable way for fleets and consumers to reduce emissions and improve local air quality while seeing better engine performance," said Rob Elam, CEO of Propel. 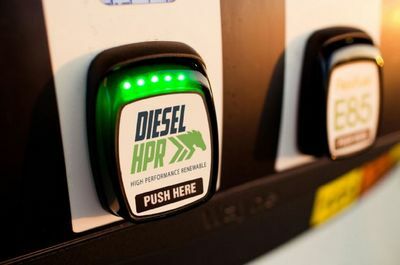 "As new diesel models hit the market, drivers across California are moving towards low carbon fuel options such as Diesel HPR." Propel, California's largest retailer of low-carbon fuels, offers Diesel HPR at 32 locations across California in Los Angeles, Orange Country, San Diego, Inland Empire, Sacramento, Fresno and the Bay Area. Drivers can easily find the nearest Propel Diesel HPR location and real time pricing by downloading Propel's mobile app available in the Android and Apple app stores. A complete list of locations is also available at propelfuels.com/locations. Propel also provides Diesel HPR commercial and bulk availability for business and government fleets statewide. Propel was founded in 2004 with a mission to connect consumers to better fuels. Propel has pioneered clean fuel retail, leading the industry with unparalleled innovation in retail technology and customer experience. With 43 Flex Fuel & 36 advanced diesel locations across California and Washington State, Propel provides new fuel choices that are higher in performance, deliver better value and create healthier communities. Propel has also developed CleanDrive®, the nation's first integrated carbon emission reduction tracking platform. Propel is ranked among 2015's top 10 private companies in Silicon Valley and is recognized by Inc. Magazine's "Inc. 500." More information is available at propelfuels.com and by following Propel at facebook.com/propelfuels and on Twitter at @PropelFuels. Locations and real time pricing can be found on Propel's mobile app available in the Android and Apple app stores.